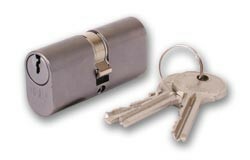 These Oval profile cylinder locks come in a range of qualities. The economy range starts from as little as £9.31 from ASEC, on the other end of the market are the more high end oval cylinder locks including the high quality product, Garrison's key turn oval profile cylinder lock which is priced at £35.11. The dimensions also vary from 30mm x 30mm to 70mm x 70mm, this allows you to apply the specific sized lock needed for the door you own. Each of the products is supplied with at least 2 keys although some offer more. There are also opportunities to purchase more keys underneath the product's description section. The locking mechanisms also differ with some products offering a 3/4 pin system whilst other products offer a more secure 7/8 pin system.